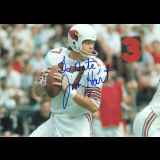 James Warren "Jim" Hart is a former American football quarterback in the National Football League for the St. Louis Cardinals from 1966 through 1983 and the Washington Redskins in 1984. From 1974-1976, he guided the Cardinals to three straight 10+ win seasons along with back to back division crowns in 1974 and 1975. He was also selected to the Pro Bowl four times 1974-1977. In the 1977 game, Hart threw five interceptions, the most in the game's history. Hart was named the NFC Player of the Year by UPI, All-NFC and second team All-Pro at the conclusion of the 1974 season. He is a graduate of Southern Illinois University Carbondale and served as the school's Athletic Director in the 1990s. Hart was inducted into the Missouri Sports Hall of Fame in 1998 for his contribution to the sport of football. New Response (Success): sent 5 cards signed all in blue sharpie and person..
New Response (Success): Signed and personalized (as requested) a Sports Il..